You'd be forgiven for thinking that writing for Jalopnik is the most glamorous job in the world. But in between all the cash, the cars, the accolades, and the tormented daughters of automotive giants, sometimes you have to make like a paprazzo and chase down an incredibly immaculate early 1980s Toyota Corolla. I usually take pictures of cars for LCBC when they're parked, because it's much easier and much less creepy that way. I just couldn't resist chasing this Corolla down, though, simply because of how spectacular it looks. Seriously, there's not a scratch, dent, or ding, and that's simply unheard of here in New York. You might as well run for mayor as a Mormon who wants to ban gay marriage. Is it technically possible? Yeah, I guess, if we lived in some sort of parallel universe where Orrin Hatch was born in Brooklyn. It's likely from around 1979-1980, judging from the four round headlamps, which were replaced by ugly rectangular blocks until the E70 Corolla was phased out in 1987. 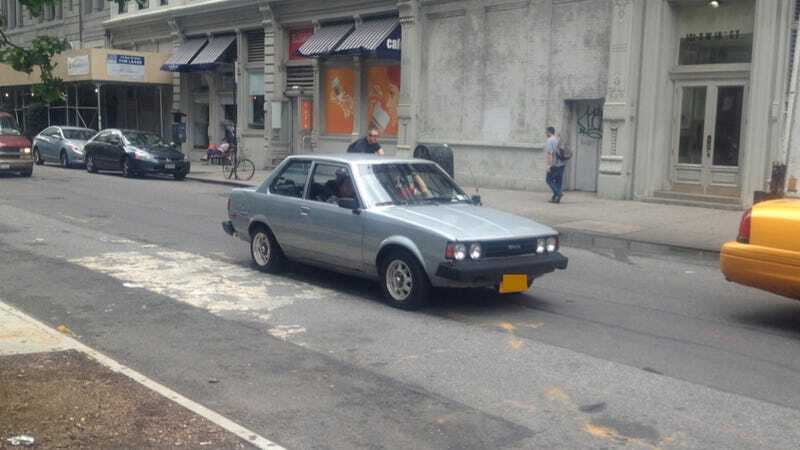 Also, before 1982 Corolla's had no power steering, so that's got to be fun when trying to parallel park in Manhattan. The 3T engine only had about 75 horses, but the entire thing weighed less than a ton and it had rear-wheel drive. Don't lie to me and tell me this little car isn't fun. Seriously, just look at it. Even the wheels shine. This Corolla is like a goddamn unicorn.